Our mother wasn’t gentle. Party girl, Father called her. She forgave his rages. “You deserve it,” she’d tell us, when he grabbed his belt. But all that’s old now. Now she can barely speak. In truth, I lead. She follows. “Roll out the barrel, we’ll have a barrel of . . .” Silence. I squeeze her fingers. The swollen knuckles, the wedding ring. 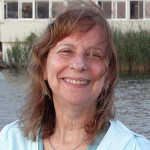 Nancy Ludmerer‘s flash fiction appears in Green Mountains Review, North American Review, KYSO Flash, Vestal Review, Gargoyle, and elsewhere, and her microfiction “First Night” (River Styx) is reprinted in Best Small Fictions 2016. She lives in New York City with her husband Malcolm and cat Sandy, a rescue from Superstorm Sandy. Nancy- A wonderful micro. Congrats. Thanks so much, Paul. I especially appreciate the praise coming from such a master of the form. And thank you also for introducing me to cahoodaloodaling to begin with (by publishing your own great work there)! Jack — thanks, as always, for reading, and for your kind words.